Experts from a wide range of fields took part in a media training day for women organised by City, University of London and the BBC. 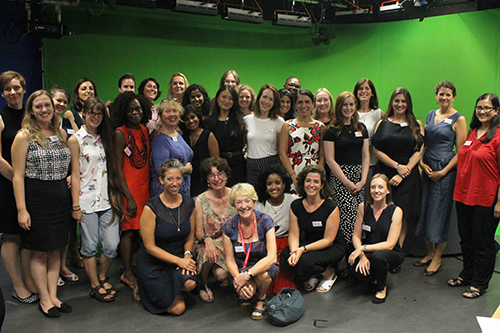 Professor Lis Howell, of the Department of Journalism, hosted Expert Women Extra, which brought together participants from previous BBC Expert Women events. The aim of the ongoing programme – run by BBC Academy – is to give women interview skills and knowledge about how to engage with the media. As highlighted in research by Professor Howell, far more male experts appear on broadcast news programmes than female experts – although the ratio is gradually improving. Expert Women Extra included interview practice in the Department of Journalism’s television studios, a visit to ITN and discussions with senior journalists from Sky, ITV and the BBC. Those who took part in the training day came from fields such as business, health, politics, fashion and law. It followed the 2018 Women on Air conference, which was hosted by Professor Howell at City and brought together leading journalists and MPs to discuss the representation of women in the media. Professor Howell’s latest research shows the average ratio of male to female experts interviewed on flagship broadcast news programmes is 2.2:1.